At least five protesters have been killed and 16 injured on a second day of clashes with security forces in Iraq's city of Basra, officials say. They say at least 14 members of the security forces were also hurt in the southern city as demonstrators threw petrol bombs at government buildings. Crowds in the city are angry about the lack of basic services, including drinking water, and jobs. 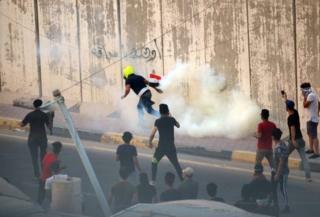 One protester was reportedly killed during similar clashes on Monday. The government says it is trying to tackle the problem. The protests come as Iraqi politicians are struggling to form a functioning government following inconclusive parliamentary elections in May.